Studying the works of Markus Åkesson you will notice an intrinsic beckoning for greater thought. The Swedish Neo-Figurative artist imparts a distinct sort of life into his paintings that may provoke an initial juxtaposition with our own. His oil paintings display a degree of hyperrealism that effortlessly strikes viewers. Yet with further insight, its verve becomes deeper. Åkesson exhibits a mastery of capturing light in his work that it lulls viewers into a dialogue with the ghostly divine realm he fabricates. 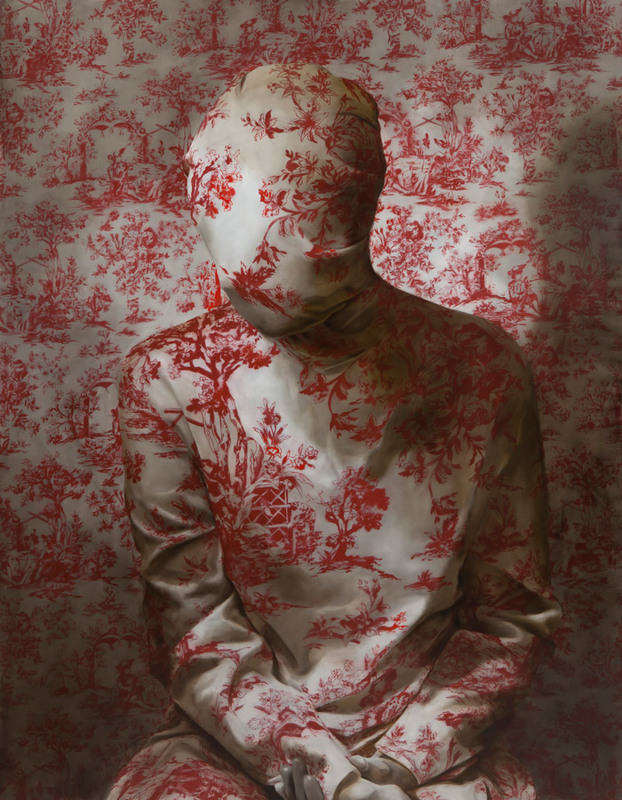 Speaking of fabric, Åkesson is known for tangling his subjects in reams of elaborate textile. In several paintings, patterns coexist in an overlaid fashion, polymorphic and ever occupying. In his 2014 painting “Girl with an enamel tongue,” the pattern motif takes on a more subtle role yet still flourishes within the context of a fair-haired girl with an expression that seems to pronounce the lingual ornament. Two years later, Åkesson spawned “Girl with a tattooed tongue,” a graceful echo of the skilful textile manipulation he showcased in his earlier work. In addition to patterns, Åkesson has nimbly depicted an array of subjects like animals, vases, insects, furniture, skulls, and even cow hearts. His use of skulls and hearts delicately frolic on this idea of morbidity, illuminated by a dream-like glow, emanating from an area in the painting unseen yet undeniably sensed… much like death. With a vast catalog of oil paintings, it is no surprise that Åkesson possesses artistic skills extending beyond the canvas. He is adept in glass sculpting and ink drawings alike. At the beginning of the year, the artist curated “The Spell” for a museum in which he is represented by, the Galerie Da-End in Paris. The sculpture features a stunning translation of pattern as seen in his paintings onto a kneaded, somewhat circular figure. His dabbling in ink drawing has produced several works that seem to outline the simplicity of youth, sometimes including larger-than-life moths and dragonflies accompanying the adolescents. With both his home and studio based in the humble woods of Nybro, Sweden, Åkesson has been lauded for his artistic works internationally. Exhibitions showcasing his work has taken place in Paris, London, Brussels, and many cities across Sweden from 2009 to present. Åkesson has received several scholarships and grants over the years for his work from entities like The Swedish Arts Grants Committee and the Regional Council in Kalmar. Major Swedish publication, Barometern, bestowed the native artist with the Golden Feather achievement back in 2014. As mentioned earlier, Markus Åkesson is represented by Galerie Da-End and Vida Museum & Konsthall.